Retrofitting technologies provides an increase in ship performance, which leads to a reduction in fuel consumption and greenhouse gas (GHG) emission. It is therefore critical to investigate and predict the effect of retrofitting technologies on ship performance considering recent attention and regulation of NOx, SOx and CO2 emissions from shipping. Department of Naval Architecture, Ocean and Marine Engineering, University of Strathclyde and Glafcos Marine perform a joint research project funded by Glafcos Marine to develop a wake Equalising Duct with Fins to reduce the fuel consumption of the bulk carrier by increasing the efficiency of the propellers. The retrofitting device is shown on the hull of the bulk carrier in Figure 1. Figure 1. WED with fins on the hull of the bulk carrier. 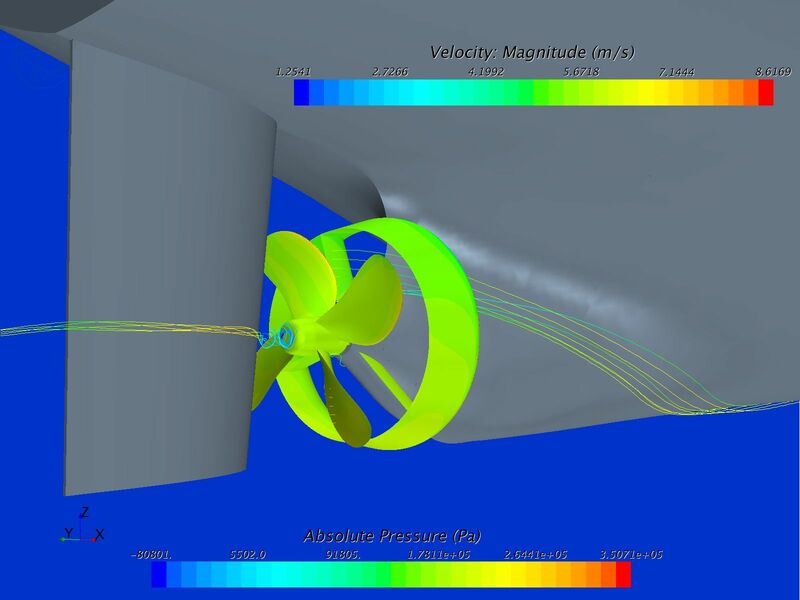 The key objective of this work is to perform fully nonlinear unsteady RANS simulations to predict the effect of the use of wake equalizing duct (WED) with fins on the ship performance. The simulations are to be performed for two different speeds, drafts with and without WED . Figure 2 shows the pressure distribution on the retrofitting device as well as on the stern of the hull and on the propeller for model scale. The results will be compared and the potential benefits of the use of the aforementioned retrofitting technologies on ship performance will be determined. Figure 2. Pressure distribution for model scale. 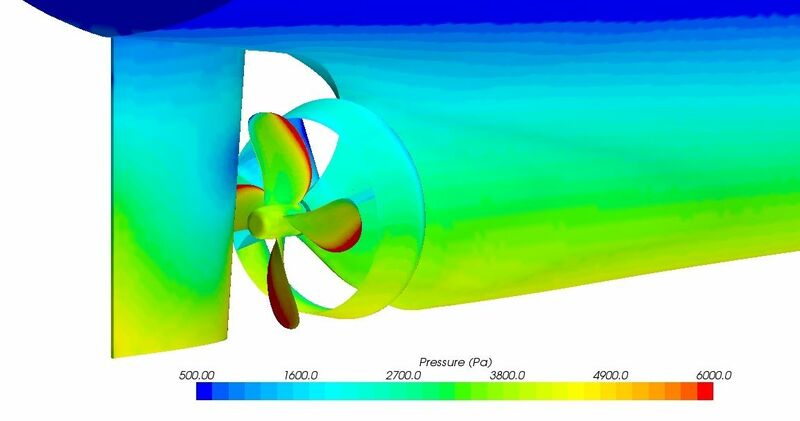 In the full scale simulations, streamlines around the retrofitting device have been analysed since the aim of the device is to direct the flow to the propeller and to increase the propeller efficiency by this way. Figure 3 demonstrates the streamlines, and the hub vortex and the interaction with rudder. Figure 3. Streamlines and hub vortex. For more information about the project contact Yigit Kemal Demirel (yigit.demirel [at] strath [dot] ac [dot] uk) or Prof. Osman Turan (o.turan [at] strath [dot] ac [dot] uk), Professor at the Department of Naval Architecture and Marine Engineering at the University of Strathclyde.